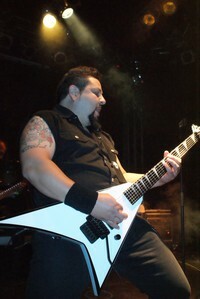 Two days ago it was time for Cage to rock and now Helstar kicked off their tour in Essen. The first shows Helstar had Lanfear with them, later Loch Vostok should take over. But todays opening act were The Claymore! 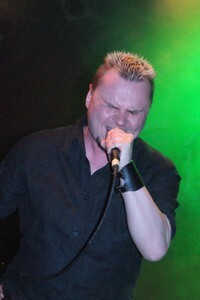 I saw the band before and so I knew what to expect from singer Andreas Grundmann and his pales. But I'm not too familiar with their songs, but during their short set they mainly played songs from their current release Sygn. But they also played some older track (Ancient Enemy, Arborlon) and a cover - The Trooper. Well, it was a good idea to add a cover to make it easier for metal heads who don't know them, but Dragonsfire also played this track. Perhaps it would be a good idea to look for another classic which isn't played by everybody... Anyway, the band from Castrop-Rauxel had some fans in front of the stage and they had a good time. 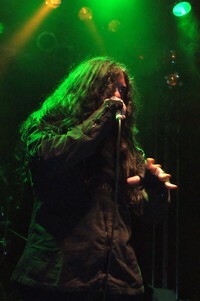 After the cover version they presented Slain The Almighty and Soulseeker from their latest CD. Lanfear were next in line and they were out to promote X To The Power Of Ten live. Lanfear bassist Kai had a motorcycle accident and so the band had to do these shows with a substitute - their former bassist Alex. But they did really good, even if not everybody got their jokes. Anyway, singer Nuno talked with the audience and he could convince the people with this powerful voice. Songs like Brave New Men and X To The Power Of Ten made the people move. But they also offered some older gems like Zero Poems and Time's Dark Laughter. 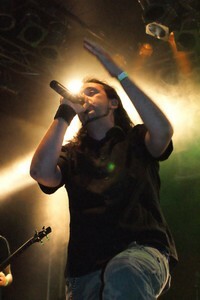 Their power metal tunes were spiced up with some progressive elements and the great voice of Nuno. Perhaps they were a bit too progressive for some of the bangers, but I would like to see more of Lanfear! Another short break and Helstar set the house on fire! The King Of Hell opened up and singer James Rivera entered the stage with a mask... Like last year at the RockHard festival the quintet was going full force. Guitarists Larry Barragan and Rob Trevino were always in motion, switching sides and close to the fans while bassist Jerry Abarca were staying in the back. Before the show James Rivera wasn't feeling to well, but as he commented during the set, he felt better after the warm welcome from the fans. The Texas metal heads offered old and new tracks incl. Evil Reign, Pain, Harker's Tale, Dracula's Castle, Angel Of Death, Winds Of War and Wicked Disposition - as Rivera told us, his favorite song of The King Of Hell. They kicked off the encore with Garden Of Temptation followed by the classic Run With The Pack! It was great to see them live again and as usual it was over too soon!